The more I talk about HS2 to local people in Woodlesford the more angry I become. There is a legitimate debate to be had about the pros and cons of HS2. There is a legitimate debate to be had about the exact route it should take. There can be no debate about how the consultation and compensation process has been handled. It is a complete and utter disgrace. It is more than two weeks since the government announced the proposed route for second phase of HS2 yet local people still haven’t been contacted by HS2 Ltd. Both HS2 Ltd and Tory secretary of state for transport Patrick McLoughlin have shown utter contempt for local people that they can’t even be bothered to send letters to the homes that will be immediately affected. David Nagle and I have already written to every home in the immediate area so we can start to collate a list of peoples’ concerns that we will present to HS2 and the secretary of state. 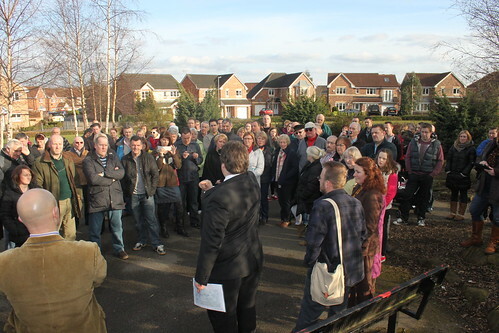 Last Saturday the three Rothwell councillors and Elmet and Rothwell MP Alec Shelbrooke met local residents from the Maltings and Locks estates at two open air meetings attended by more than 100 local people. I’m also dismayed that Alec Shelbrooke doesn’t want to stand up in the House of Commons and ask the prime minister David Cameron and Patrick McLoughlin to answer questions. Local people quite rightly expect more of their MP and it’s not good enough for Alec to glibly dismiss asking questions in Parliament as “just pontificating” as he did on Saturday when I challenged him about this. He’s happy enough to pontificate on taking benefits off working families that need them, but not on behalf of his constituents! As all three political parties support the principle of HS2 I really thought that all local politicians could work together on this. Alec is the only one of us that can stand up in Parliament and ask those questions. He’s the one we elected to send to Westminster. My colleagues and I would certainly be asking those questions. The consultation process is so feeble that neither HS2 or the Department of Transport have even bothered to contact local councillors so that we can properly help our constituents. Both residents and ourselves are forced to rely on an inadequate website and residents who’ve emailed HS2 haven’t even had a reply. The responsibility for this incompetent shambles lies directly Patrick McLoughlin. He might claim the plans for consultation were drawn up under his predecessors Justine Greening and Philip Hammond, but that’s no excuse for not improving them. I’m calling on McLoughlin to start treating local people with some respect and consideration. It is unacceptable that neither HS2 nor his department have yet been in direct contact with local homeowners and local councillors. The Tory/Lib Dem government has already demonstrated its incompetence in managing transport with the fiasco of the west coast rail franchise so McLoughlin needs to get a grip on his department. I’m calling on him to instigate an immediate review of the consultation and communication for HS2 and to implement a new plan that truly listens to local people and lets them know what is happening. The route into Leeds through Woodlesford is one of the most important sections of the HS2 line so I’m writing to Patrick McLoughlin to ask him to visit us and see for himself how it is affecting local people. This entry was posted in Campaigning, Elmet and Rothwell, Environment, Housing, HS2, Oulton, Tories, Transport, Woodlesford and tagged Alec Shelbrooke MP, Elmet and Rothwell, HS2, Woodlesford by Karen Bruce. Bookmark the permalink. My “home” looks directly onto Woodlesford Canal….iam gutted about all of this, its all like a bad dream….your government needs a serious overhaul and should focus on more pressing issues then that of a High Speed Train line….ie: education, health care, poverty, crime, etc. Hi Kelly, just to clarify it isn’t ‘my’ government as I’m a Labour councillor.